As you develop your law firm’s content plan, focus your efforts around two reader engagement goals: Discovery and Habit. I use those words in particular because they clarify how you are seen in the minds of the people you are trying to reach the most: your readers. And when stated as distinct objectives, they can focus your firm's tactical planning around content creation and follow up. Here’s what I mean. “Discovery” is the rallying cry for all of your efforts to get in front of people who should know what your firm does well, but don't. When it comes to content strategy, that means: all efforts to ensure that your firm’s publications are found and read online by a target audience. Period. The pool of people who should know you for what you do (prospective clients and referral sources, for example) is much bigger than the pool of people who already know you (clients, past and present). While it is critical to engage both groups, you are handicapping your efforts if you don't spend time focusing on being discovered, making yourself available to readers where they gather. I say this because the key to discovery is the assumption that a significant number of people you should be engaging don't start with knowledge of your firm, your practice group, your lawyers. Only a fraction of the whole will make it to your site at the start of their journey - and so it is essential for you to take the work to them. This is one key strength of the digital age today: your ability to put your brand, your writers, your message, your expertise in front of your target readers where they gather. The readers you should be engaging care only about legal issues of the day and how they impact business. They're online looking for information - and during that process, they discover you. If, that is, you make it so. People who discover your content (as above) are, by definition, first-time readers. But do those readers make a habit of reading you again? That should be your next, most pressing goal. ...the main way to guarantee habit is by providing value to the readers whose attention you are trying to keep. “Habit” can be supported in a handful of important ways (by encouraging people to subscribe to a feed of future content by email or social platforms), but the main way to guarantee habit is by providing value to the readers whose attention you are trying to keep. In short, “Habit” is the rallying cry to guide your editorial and technical efforts to keep the readers you’ve worked so hard to earn in the first place. Usually, this manifests in a handful of ways: Are site visitors signing up for our email alerts? Are people following us on Twitter, LinkedIn, or even Facebook? Are readers following us on JD Supra? What’s the open rate on our emails? How many visitors to our website are return visitors? For that matter, are we writing about what our prospects care about most? For example, JD Supra is well known as a leading engine for discovery (we put professional, need-to-know content in front of people who might not otherwise see it), but on a daily basis we also focus greatly on making readers of your work habitual readers. Our tools and offerings, big and small, are created with integrated content strategy in mind. A few examples, among others: All firms, authors, and topics can be (and are) followed by subscribers interested and engaged and wanting to learn more from the folks they've discovered and identified as thought leaders. Our Beacon Reports help firms determine where to focus content efforts in the first place ("What does our target industry care about most right now?"). Our analytics include reporting on social shares so writers can connect with readers who value their work enough to talk about it publicly (thereby turning discovery into connection). 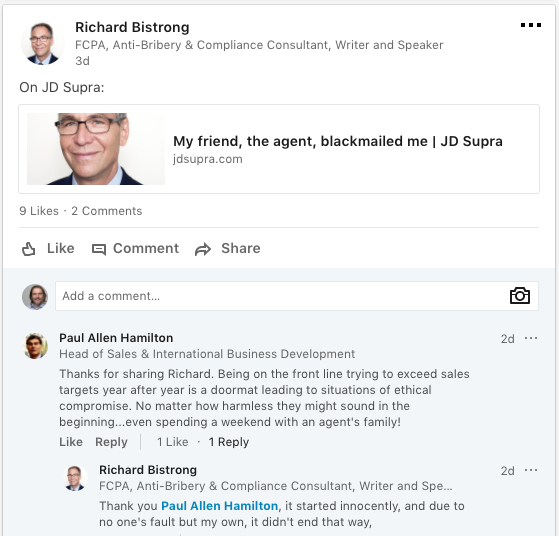 Our sync between JD Supra and LinkedIn (pictured below) allows anyone publishing new work to automatically announce it to their professional network (thereby turning connection into habit and engagement and...). I say all of this with pride but not to boast about JD Supra. The point is universal: Random acts of content don't make for a strategy. Nor does writing an article or two and waiting for new clients to call make a strategy. But if, for example, you include in your plan the ongoing goal of connecting with new readers on LinkedIn, they don't stay new readers for long. They become habitual readers, as per my LinkedIn sync example above. Are people discovering our work online? Are they coming back for more?